We are excited to announce the 10th Annual State Speaker Scholarship Program has launched! The 2018-2019 program will support the appearances of keynote speakers at state parks and recreation associations’ annual or regional conferences. State associations that are chosen will receive a scholarship of $2,500. Since the scholarship program’s inception in 2009, Landscape Structures has awarded more than 200 scholarships to state associations and more than $530,000 to support the appearances of speakers at park and recreation conferences throughout the nation. To complete an application for Landscape Structures’ 2018-2019 State Association Speaker Scholarship, visit playlsi.com/speaker-scholarship/. We were proud to offer the New Hampshire Recreation & Park Association (NHRPA) a Speaker Scholarship for the 2017 State Conference to support its members’ professional development. Today, we’re happy to have Greg Bisson, assistant director for Exeter Parks and Recreation, as our guest blogger discussing how NHRPA and its members are enhancing children’s lives through play. New Hampshire Recreation and Park Association is made up of municipal park and recreation professionals whose purpose is to promote and advocate the development and administration of recreation and park services through educational sessions, meetings, seminars, and conferences to improve recreation and park activities and facilities in New Hampshire. These support and training opportunities help members develop the skills necessary to enhance children’s lives through play. Our members continued pursuit of improving the quality of life for children is a staple of our organization. Three pillars—programs, facilities and community—help shape the lives of children. Without programs and facilities, the children in New Hampshire would be hard-pressed to find a safe environment in which to participate. The rural landscape with a few urban centers makes our state difficult to navigate children’s recreation. However, our determined professionals find ways to connect children and families and create community. Our members practice what they preach; they work hard and play harder, and enjoy all of what New Hampshire has to offer. While our state is unique geographically—the ocean, mountains and large cities are just a short drive away—our members continue to find new ways to enjoy our region and promote all it has to offer. During our state conference, Keynote Speaker Steve Maguire brought his passion for recreation, especially summer camps. After a long summer, our members needed someone to recharge their batteries. And Steve did exactly that! His passion along with his expertise gave members the lift they needed. He challenged us to be better at our jobs, and encouraged us to strive to be memorable. This is what all parks and recreation professionals need to do. Help children and families create memories. At the National Recreation & Park Association’s Annual Conference earlier this week in Las Vegas, we ROCKED the exhibit hall! Our booth space featured The Canyon Collection™ and a customized Netplex™ in our new colors, plus we had rock star cardboard cutouts, root beer kegs and Pop Rocks. Visits to our booth were met with our nature-inspired climbers, which enticed many to test out their rock-climbing skills. All that play combined with Pop Rocks took attendees back to days from their youth! On Tuesday night, we rocked the Exhibit Hall Reception with karaoke, margaritas in light-up glasses and lots of photo ops. It was so much fun, Elvis even stopped by to sing! We had a great time in Las Vegas visiting with park and recreation professionals, hearing from industry experts and taking in all that the city has to offer. 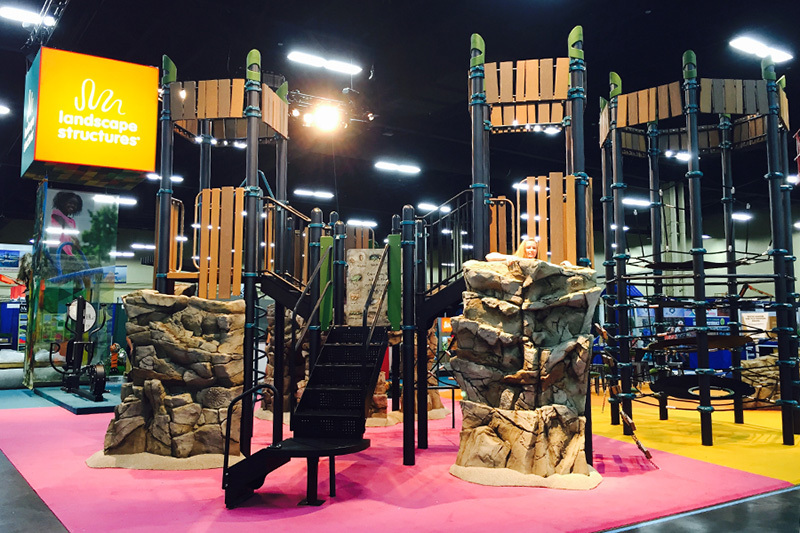 Our employees and playground consultants are already looking forward to the 2016 NRPA Annual Conference in St. Louis!